The tripod market has become crowded in recent years, and discerning the good from the bad has become increasingly difficult. Buying a low quality tripod typically means buying a second tripod – if the first tripod does not turn the photographer off to tripod use altogether. Though increasingly difficult, selecting a good quality tripod is as important as it ever was (or more so). Gitzo 3-Series carbon fiber tripods have been my standard choice for many years. They are the best of the best. Unfortunately, they are also priced as such. And their prices have increased significantly in the last few years. Many cannot pay the premium for the Gitzo tripod, but they still want and need a high quality model. I'm always searching for good value gear to be able to recommend to such tripod shoppers. As I walk the PhotoPlus Expo each year and walk B&H's superstore on occasion, I’m always looking for good recommendations for budget-minded photographers. At B&H's suggestion, I accepted an Oben CT-2491 Carbon Fiber Tripod to review. The Oben tripods look great, are very well constructed and ... this model holds me (170 lbs. / 77kg). Want to know how strong a tripod's leg locks are? Fully extend the legs and tighten the leg locks. While keeping the legs together (not spread), pull down with all of your weight. Note that exceeding the weight limit of a tripod could break it (I do so at my own risk), but strong leg locks will not retract under the pressure of my weight. The Oben CT-2491 holds solidly. To further test the strength of a tripod, I fully extend the tripod legs and spread them to the first stop and then hang from them. Again, exceeding the weight limit risks breaking the tripod (and there is a chance that I will hit the ground fast if that happens). But, I know that the Oben holds my weight, and I am now confident in loading expensive gear onto these legs. I am also comfortable recommending that you do the same. Supporting my weight may seem like an excessive requirement, but I sometimes rely on my tripod to hold me personally. While not all photographers get themselves into the situations I get into, those of us who do need to rely on the tripod legs to support ourselves while navigating steep trails, large rocks and other difficult terrain. Strength is a very important consideration for tripod selection, but there are many other considerations. One consideration is the material the tripod legs are constructed of. Most typically, today's tripod legs are made of aluminum or carbon fiber. Aluminum dents and bends while carbon fiber breaks. Neither is good and the latter is less likely, but dented and/or bent may remain usable. Also for consideration is that aluminum is susceptible to corrosion - especially if used in/around salt water. One of aluminum's biggest advantages is lower cost. Carbon fiber, used in the Oben CT-2491, is my strong preference. Load capacity and weight of the tripod is generally a compromise. To hold more weight, a heavier tripod is needed. A rule of thumb used by many photographers is to select a tripod with a load capacity of at least 2x the weight of the gear intended to be mounted on it. While the manufacturer load capacity rating may be accurate, a stronger, more-rigid tripod will reduce the amount of vibration experienced. And eliminating vibration is a key reason for using the tripod in the first place. Thus, many go for at least a 2x load capacity rating. 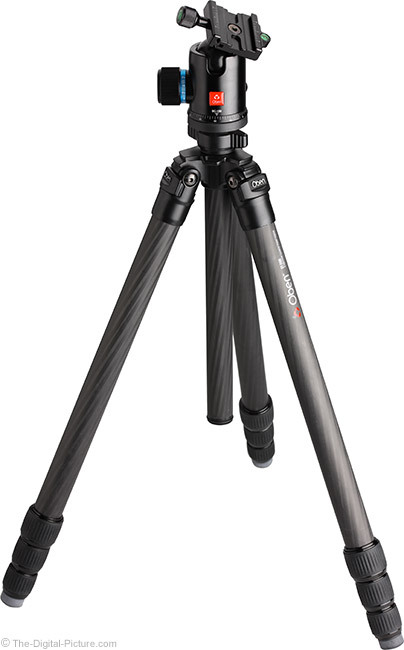 The Oben CT-2491 Carbon Fiber Tripod has a load capacity of 39.6 lb (18kg). Even using the 2x rule, this tripod can be used for nearly 20 lb (9kg) loads – loads considerably heavier than most of us will be placing on a tripod. 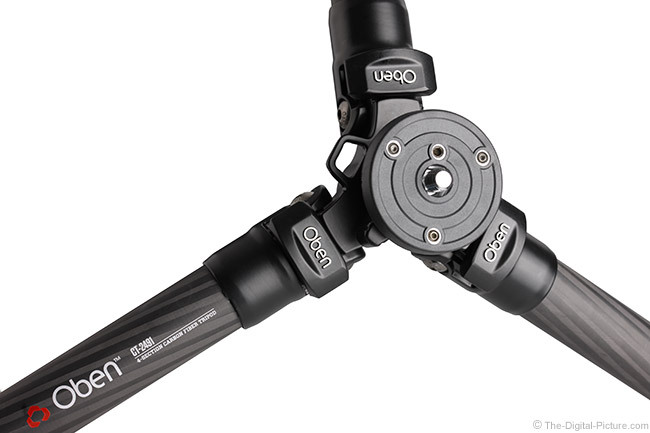 Like most tripods, the Oben CT-2491 has a center column that is both an asset and a liability. The advantage of a center column is the ability to quickly fine tune camera height and to enable very high camera positions. The big disadvantage of a center column is significantly increased vibration when the column is being used in the raised position. The higher the column is raised, the more vibrations will be enabled. The difference is obvious. Carbon fiber center columns as found on this Oben model are slightly lighter than aluminum center columns, but aluminum is smoother to raise/lower due to less friction. To get a tripod low to the ground, the center column must be removed or reversed if other provisions are not made available by the manufacturer. Another tripod selection consideration is the number of leg sections. I generally go with 4-section legs (the "4" in the "2491") for my primary tripod. This gives me a more-compact retracted size that is especially appreciated when traveling. 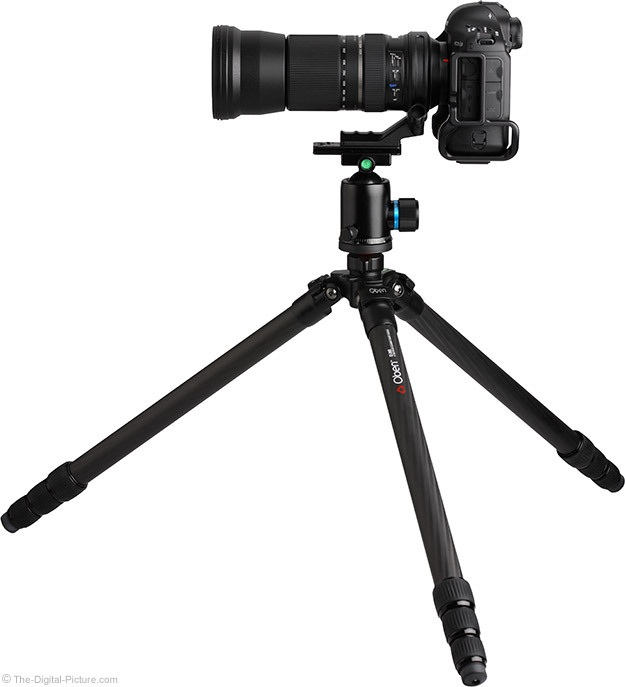 Because there is one additional leg lock on each leg, 4-section tripods may cost a bit more (the CT-2491 costs $50.00 more than the 3-leg-section CT-2391) and will likely take slightly longer to setup. With the lower leg section having a smaller diameter, a 4-section tripod with the lower leg section extended has the potential to be slightly less stable than a 3-section equivalent. 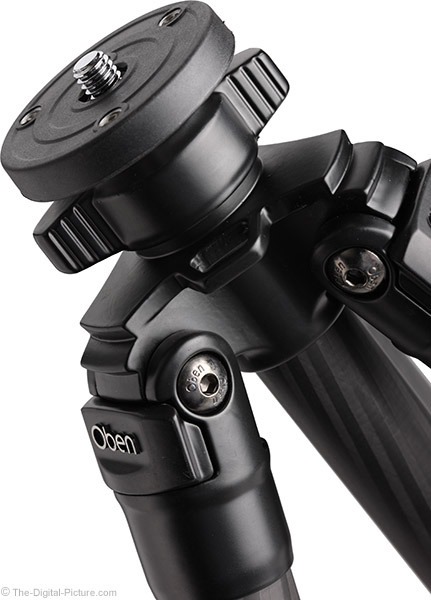 Tripod leg lock choices are typically twist-lock or flip-lock styles and Oben offers both. This choice is generally a personal preference, but I have grown used to the twist lock style found on the Gitzo tripods. Thus, I chose the Oben twist-lock tripod version (the "T" in the "CT"). Another important-to-me tripod feature found on the Obens is independent leg spread. For general purpose use, you want your DSLR tripod legs to open at various angles to accommodate whatever terrain you may encounter. For example, I shot this picture with two legs fully extended at their tallest lock angle and one leg fully retracted and spread nearly horizontally to my left, balanced against a cliff. The Oben CT-2491 above shows an optional, also-excellent Oben BC-139 Ball Head. This is an ideal combination. 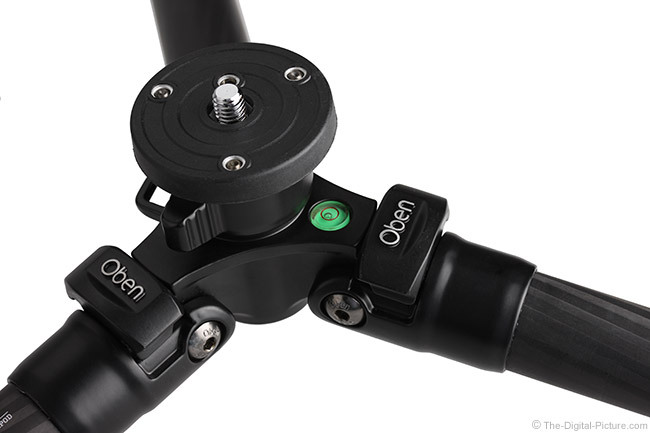 Starting the Oben CT-2491 tour at the bottom takes us to the tripod's twist-retractable spikes. The spikes twist extend/retract from/into the Oben's rubber feet. The 6x carbon fiber leg sections are smooth with an attractive, high quality look and feel. Important to me is that the leg sections do not rotate, allowing individual leg locks to be tightened while others remain loose. The Oben twist-locks are the more-conventional long/slow-twist type (vs. quick-tightening locks). As I said before, when locked tight at full extension, these locks can support me. The Oben CT-2491 Carbon Fiber Tripod's cast aluminum alloy chassis/spider is very nicely designed and is quite strong. Pull the aluminum angle locks outward to allow the legs to spread wider than the first stop. Decide which of the three leg angle notches you want to use by pulling the angle lock out to the right distance for the desired stop. Once you familiarize with the tripod, you can set the angle lock and the legs will open to a specific spread angle. The widest setting is used to reach down to the CT02491's 6.0" (15.2 cm) minimum height (with the center column removed). A light grease under the angle locks is likely to collect some dust. A bubble level is provided on the chassis. Don't like the force required to spread the legs? Loosen or tighten the axle bolts with the included wrench. This tripod has a center column made primarily of carbon fiber. The center column does not rotate thanks to a slot running the length of the column that slides over an alignment post in the chassis. At the bottom of the column is a spring-loaded hook for holding weight (to more-solidly anchor the tripod). At the top of the column is the mounting plate. The plate is nylon/plastic-covered aluminum. Set screws are provided and should be used as it is difficult to get a head completely tight onto the top plate's slippery coating without set-screw-locking it on. Depending on the head being used, getting the right set screw torque is important as the head's panning base may become frozen if too much torque is applied. I am characterized by over tightening things and of course learned this first hand. The center column is both removable and reversible. Unscrew the bottom of the column (including the weight hook) to allow the column to be removed up through the chassis lock. The column can then be inserted upside down to allow your camera to be mounted as low as ground level. This is great for macro photography, but the upside-down camera may take acclimation. Unscrew from the piece of aluminum just below the top plate to remove the column entirely. Note that a set screw must be loosened before twisting the top plate and aluminum cylinder off of the center column. Otherwise, the threads will be damaged. The remaining piece of female-threaded aluminum cylinder becomes the very short center column, which allows the tripod legs to be spread to their widest angles for the lowest camera mounting height possible. Examples of this setup can be seen in some of the photos in this review. Without the bottom stopper cap threaded into place (it does not mount into the aluminum cylinder), extra care should be taken to insure that the mount plate doesn't slip out (with your camera on it). The center column lock (the butterfly knob) must remain very tight without this additional protection in place. The orange rubber damper below the top plate cushions the center column when retracting – to help avoid camera damage. The tripod head mount screw is reversible with 1/4"-20 & 3/8"-16 thread sizes available to fit nearly all available head models. Overall, this is a very light weight, very high quality and very solid tripod. I used camera and lens combinations sized up to the Canon EOS-1D X and Canon EF 600mm f/4 L IS II USM Lens with no trouble. The tripod holds me, so that it can hold a big camera and lens is not a surprise. As far as vibrations go, I am comfortable using lenses up to 300mm on the CT-2491 with the center column fully retracted and would go to 400mm if conditions were ideal or the legs were fully retracted. I was even using the Tamron 150-600mm VC USD Lens at 600mm on the CT-2491 during a recent day I spent in Philadelphia. You will want to limit extended center column use to wider angle lenses and/or ideal shooting conditions due to the increased vibrations exhibited in this state. Retract the legs completely for the most-solid setup. This tripod has plenty of height for me (6'/1.8m) to comfortably shoot upward from a standing position even with the center column retracted. Remember that your tripod ball head and camera/lens tripod-mount-to-viewfinder heights add significantly to the tripod's height during use. Finding just the right tripod case is always a challenge. The limited number of available cases never seem to have the right size included. And the space allocated for a head complicates the selection even more. The great news is that the Oben comes with a padded nylon case and allows just the right amount of room for a ball head. A small pocket inside the case will hold your remote release and/or the included hex key wrenches. 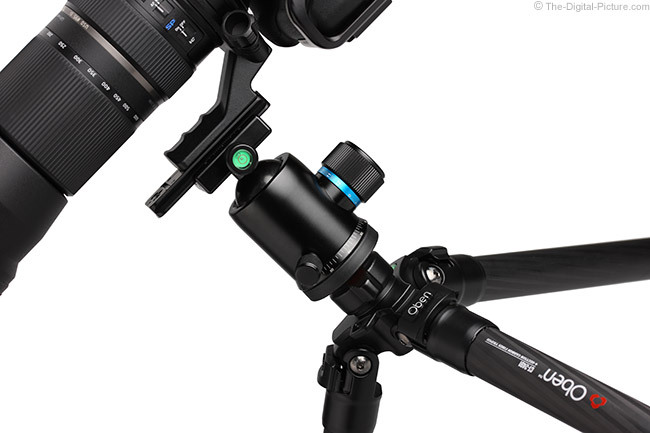 While the Oben CT-2491 is not inexpensive, it is $350.00 less than the Gitzo GT3542LS as of review time and has been as much as $450 less while I was preparing for this review (due to Gitzo price fluctuations). Some of the other differences between these tripods are obvious in the table above. The Oben weighs noticeably less and goes to noticeably higher heights. With a narrower chassis/spider, the Oben also consumes less space. Comparing these two tripods side-by-side is required to find the biggest differences. The first difference is in vibration control. The heavier Gitzo is rated for a heavier load capacity and even retracted, there is less vibration visible in the camera viewfinder when using this support. Fully extended, the Gitzo is noticeably more solid. The Gitzo's larger chassis/spider (where some of the heavier weight comes from) is partly responsible for the increased rigidity. The Gitzo's (faster to deploy quick-release) leg locks are also more rigid laterally. Fully extended, the difference in leg rigidity between the two tripods can be felt by pressing laterally on the legs. Again, the chassis is partly responsible for this difference by allowing some flex. I noticed the lateral rigidity difference most when shooting on a slippery surface (snow and ice). The Oben legs would bend outward modestly with pressure. Using the spikes may have helped mitigate this issue in the snow and ice situation. The Oben CT-2491 Carbon Fiber Tripod is not going to displace the workhorse Gitzo 3-series carbon fiber tripod from my kit. When you have had the privilege of working with the best tripods for many years, it is difficult to settle for something less. This partially explains the low quantity of tripod reviews on the site. However, the Oben CT-2491 Carbon Fiber Tripod is a really good tripod and it will remain in my kit. My intention is to make this tripod with an Oben BC-139 Ball Head my dedicated flare test support. For camera safety reasons, we do not flare test focal lengths over 400mm, so this tripod should handle all that we ask of it. Especially helpful is that the height of this tripod makes the precise upward framing done during flare testing much easier to accomplish. 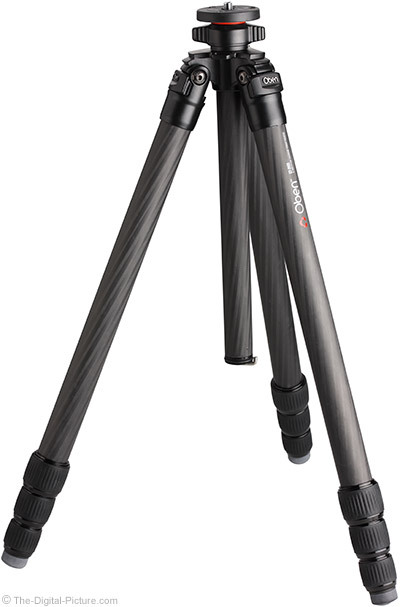 The Oben CT-2491 Carbon Fiber Tripod is a compact, light, strong, high grade tripod with a good value price. This unique combination of positive traits means it is not hard to justify the CT-2491’s placement in many photographers’ kits.